We are in the midst of a grace-filled Holy Week, commemorating and reliving the most precious salvific acts of our Lord Jesus Christ. Today we celebrate the Maundy Thursday – we recall in a special way two significant acts of the Lord, namely, the institution of the Holy Eucharist and the Lord’s washing of the feet of his disciples. Essentially these two acts point to the same reality. That is why while the synoptic Gospels all narrate the institution of the Holy Eucharist as what consisted of the Lord’s Last Supper, St. John has in its stead, the narration of the washing of the feet. The Last Supper of the Lord coincided with the Jewish Passover Feast which in its turn was the commemoration of the miraculous saving by God the Yahweh of the Israelites from the hands of the Pharaoh. As usual, Jesus and his disciples gathered in the hall to have their Passover meal. But Jesus does something unusual during this meal. After saying the prayers, before sharing the bread, he shows it to his disciples and tells them, “This is my body which will be broken for you”. So also, before drinking from the cup, he tells his disciples, “This is my blood which will be shed for you.” Then he concludes, “Do this in memory of me”. This was the institution of the Holy Eucharist. Perhaps these words of Jesus must have bewildered the disciples. How can the bread be his body and the wine his blood, broken and shed for others? 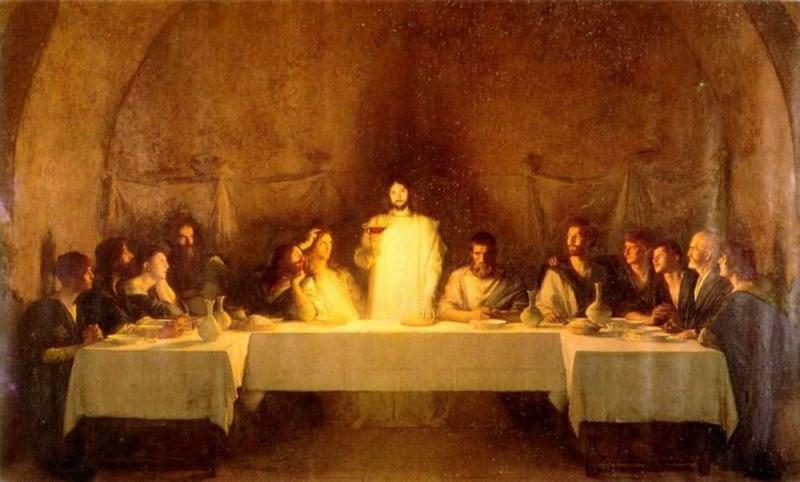 But for Jesus, the whole act of his last supper was a symbolic, sacramental celebration of his very life. The bewilderment of the disciples lasted less than a day. The next day at noon, they realized the true meaning of what Jesus did and said during the last supper. If the Good Friday were not to follow, the Last Supper would have remained a meaningless, empty ritual. It was the Good Friday that gave content and meaning to the Last Supper. In fact the Last Supper symbolically represented the sum total of the life of Jesus, the culmination of which was the death on the cross and the rising on the third day. Our celebration of the Holy Eucharist is the commemoration of the Last Supper of Jesus. It is the sacramental celebration of the total life of Jesus. But just as the Last Supper of Jesus received its content and meaning from his death on the cross, our Eucharistic celebrations have to be completed and enriched by our own acts of breaking our body and shedding our blood in our daily living, namely, all the sacrifices that we take on ourselves for the sake of love, by our service in humility, or in other words, by our readiness to wash the feet of our brothers and sisters. That is why St. John identifies the Eucharist with the act of washing the feet. Every act of genuine love, service, forgiveness, understanding, etc., demand from us an experience of dying, dying to our selfishness; it is the breaking of our body and the shedding of our blood. But the same experience contains in itself an experience of rising, rising into richer and deeper life, namely, the experience of the Paschal Mystery. In other words, the Eucharist shall not remain a mere cult in our life, rather it is our very life style. The Christian life is a Eucharistic life, which in its deeper meaning signifies that we constantly share in the Paschal Mystery of the Lord, by constantly dying to our selfishness and rising into new life of greater love. If in our daily life, we have this experience of the Paschal Mystery, of sharing in the suffering, death and resurrection of Jesus Christ, our participation in the Holy Eucharist will be richer, fuller and more experiential.